Drawing on teaching and learning research, the Sixth Edition provides new tools to improve students’ reading, focus, and self-assessment. Chapters are now divided into brief “study units,” each of which concludes with a self-test question to increase comprehension. NEW “Putting Psychology to Work” features show students how to apply psychology concepts to future careers. Our formative, adaptive learning tool, InQuizitive, and our online psychology labs, ZAPS 2.0, provide a hands-on approach to assessing students’ understanding. The text reflects three foundational goals: 1) to present psychology as a research-based science; 2) to help students become better critical and scientific thinkers; and 3) to show students how course concepts apply to daily life and future careers. Students comprehend material better when it’s broken into shorter study units. In the Sixth Edition, each chapter is divided into a series of 16–18 NEW study units. Each unit focuses on key concepts and ends with a red “Q” question for self-assessment. Comprehension is further reinforced through our formative, adaptive learning tool, InQuizitive, which uses research-proven gaming techniques to engage students in the learning process. 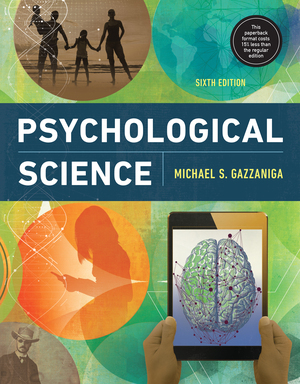 The Sixth Edition is supported by a robust suite of digital teaching tools, including an Interactive Instructor’s Guide and a test bank that is tagged to APA learning goals.